For astrological, Jyotish purposes, We specialize in natural, freshwater tissue nucleated pearls and South Sea pearls. Even though freshwater, tissue nucleated pearls are grown through a culturing process, they are 100% nacre, making them the closest in substance to the naturally grown, saltwater pearls . A very small piece of organic tissue is bead implanted to create the reaction of the oyster. During the pearl growth, this tissue nucleus (which is less than 1mm) dissolves. What we get is basically a 100% nacre pearl, without any foreign substance or core. Natural saltwater pearls (not cultivated) are a rare event in the gem market. Truly expensive in sizes over 6mm, they are not readily available. And the few available in the market place, are the odd baroque shapes, with round shapes very rare. They should be accompanied by a certificate from a reputable, independent gem lab, stating the naturalness of the pearl. Do not trust dealers that will tell you that a pearl is a natural saltwater, without an independent gem lab certificate. Beware of Indian certificate. South Sea Pearls are gorgeous, lustrous pearls that can reach up to 18-20mm in size. The latest technology uses a very small glass bead as core. 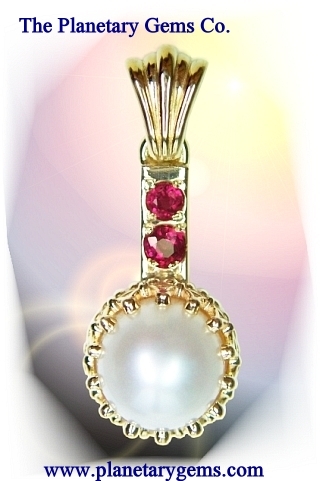 The natural nacre is aanywhere from 70% to 90% of the whole pearl. They are expensive over 14mm round sizes. Caution: Japanese Akoya, saltwater pearls (the ones that we most see in jewelry stores as striking white strands) are cultured pearls, and even though very beautiful and super lustrous, they are not suitable for astrological purposes. The reason is that they contain a large glass bead core. Hard to believe, the pearl nacre that the oyster produces around the bead is less than 1mm (anywhere between 0.2mm to 0.8mm) of the total diameter... Basically not enough pearl substance to have a significant astrological impact on the body.